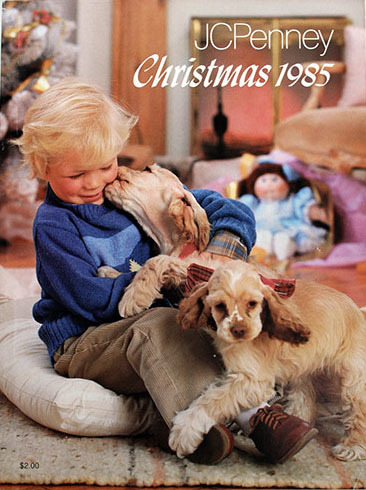 A J.C. Penney Christmas catalog. I eagerly awaited its arrival in the mail each Christmas season as a child. Is it just me, or is Christmas a little more over the top than it used to be? I grew up in southern Minnesota in the late 1970s/1980s. My parents were blue-collar manual laborers, and their hard work provided us a comfortable life. We had everything we needed, took road trip vacations, were able to buy some “extras” but nothing luxurious. In terms of gifts, Christmas was always lovely. I remember one year I had eight presents under the tree! Eight presents! All of my presents were small, probably between $10 and $20 (and the year of eight presents, probably they were all around $10). Typical gifts for me were a Barbie, jewelry, crafts, and clothing. The highlight of the Christmas shopping season was the arrival of the J.C. Penney Christmas catalog in the mail. I grabbed that thing before anyone else and began circling presents for my wish list. I would spend days with this catalog, literally days. Every year I circled the same thing: the Barbie Dream House. Who had this lovely item? Can I come over and play? I loved Barbies so much. 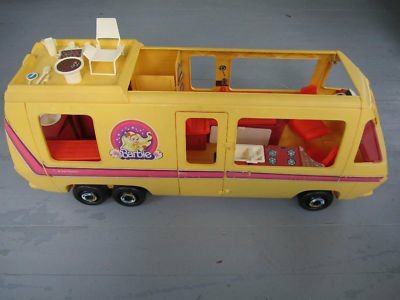 I had probably a dozen Barbies, along with lots of Barbie clothes, a couple of Barbie Corvettes, and (this was the best) a Barbie motorhome hand-me-down from Renee. The motorhome was the most extravagant Barbie accessory I had, and it was used. I could play for hours with this thing. 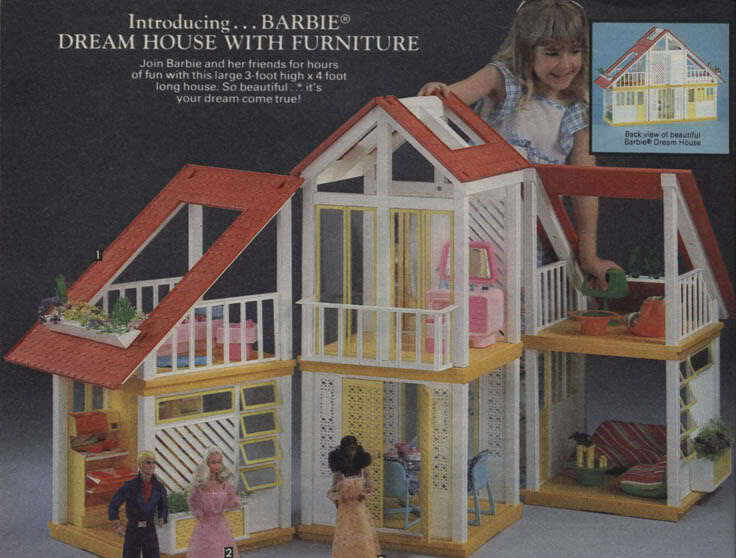 The point being, I’m sure my parents could have afforded a Barbie Dream House. But just because their kids wanted a certain gift didn’t mean they were going to get it. And if I got a $99 gift, that meant that my sister and brother also would have to receive a $99 gift, so now we’re talking $300 in the mid-1980s. My parents knew how to say “no”, and I’m grateful for that. My grandparents, who clearly remembered the Depression, were similarly thrifty. My grandparents showered me with love, attention, and their time, not gifts. Grandpa Zimny gave all the grandkids the same gift every year: $20 plus something a little extra (I usually got a notebook and pencils). Grandma Hager, with 50 grandchildren, obviously could not be as generous. Each Christmas, us grandkids under 18 years old got $5, and also something a little extra (again, usually pencils and paper—I sense a theme. Of course, as a budding writer, pencils and paper was about the best gift ever). I wonder how many parents today are saying “no” to the big-ticket item (today’s equivalent of the Barbie Dream House). I wonder how many grandparents dare to give their grandchildren only a $20 bill. You can’t buy love, right? Has that idea been lost? And the cousins on the Zimny side gave each other LifeSavers books! We learned a couple of years ago, when the kids were little that too many gifts were just overwhelming. The Disney Store had a buy 1, get one free sale so I did. And it was too much. There are all the Christmas commercials now and kids start seeing what they want as early as October. But sadly, I can walk into their room at any given time and see most of it (sometimes put away!) just lying around. The gift I wanted year after year and never got was the X-Wing fighter from Hasbro. Always asked, never got it! So this year we’re scaling back. Volunteering with Toys For Tots again. At 6 years old, Daphne just ate that up, and she has such a big heart. I think getting them into the spirit of giving helps them to not expect so much. Volunteering for Christmas is a great idea. I always wanted to do that with my nieces and nephews. I also toyed around with the idea of donating money in their names, or giving a Sharing Tree gift in their names, or going shopping with them for Sharing Tree gifts. But we don’t give them any gifts at all (I know, we’re bad aunts and uncles! ), so I just buy those Sharing Tree gifts on my own. Maybe next year I will involve them more in these efforts. I’ve stuck to minimal-present giving with my children and grandchildren, because I wanted them to know that the important things in life (affection, respect, integrity, peace) cannot be bought and sold. I think (I hope) it worked. They never acted like they resented me for not buying them more stuff. Precisely my point. Unstructured free time is good. Too many kids do not know how to play alone or use their imaginations because everything is planned for them in structured classes, competitions and such. My three “kids,” ranging in age from 19 to 27, never even attended preschool and they have excelled academically and done well for themselves. Part of that, I suppose, is that I read to them lots and made sure they had creative toys like LEGOS and Lite Brite and Play Doh. I bucked societal expectations and followed what I felt was right in my heart for my children. I’m not dissing preschool and organized activities. I just think there needs to be a balance b/n that and free play. My childhood was filled with nothing but imaginative play. Funny enough, my frugal husband usually goes a bit bonkers at Christmas, although the kids’ big ticket purchases this year are hunting clothes/boots that he bought half off and will last years. I think we indulge our kids too much, but I guess it makes up for the rest of the year when we say NO a lot! I also prefer the family time vs. the material stuff or traveling to a hockey game or dance competition (which, fortunately, we don’t have to worry about anymore!). When I was growing up with my mom’s soon-to-be ex-husband, he spent and spent and spent and spoiled us–he wanted his gifts to always be the most expensive and the biggest. The year I gave him a hardcover book from a MN writer, I thought he was going to vomit with its simplicity, though I bought it because it’s a genre he enjoys. A few days later, while he was reading on his phone and said it was the coolest thing, he told me, without any reference to my gift from days before, “Books are just things you forget in airports or clutter the bookcases.” Unreal. My sister and I shared a single Barbie, purchased from my friend Barb (how ironic) for 50 cents. We never expected many gifts and, although I sometimes felt cheated (especially when my friends Robin and Jane got rollerskates), I was always loved and happy. Anyway, lots to consider with your post. I think there is a thing as too much attention. I think back to long days playing by myself (usually with my Barbies! ), using my imagination while Mom and Dad went about their business. A friend of mine with three boys says she sometimes feels she doesn’t do enough with her kids compared to other parents. Her parents were a lot like mine, and I tell her, “It’s OK. Look how good we turned out!” LOL! Kids can play on their own 🙂 I think unstructured free time is good.